If you aren’t taking regular inventory and routinely minimizing the items you accumulate in your home, then purging before a move is a necessity. Asking yourself if particular items bring you joy or have value is a great way to start sorting. Create separate piles: keep, sell, donate, trash. Remember, you’ve got to PAY to move it, so ask yourself if it’s worth it! Once you’ve purged, organizing will be much less daunting. Organizing everything you have before you move simplifies this daunting transition. So many people wait to move to organize. This can create anticipatory anxiety and prevent you from enjoying your new space! This includes your pantry, cabinets, closets, drawers, and other nooks and crannies where things often are out of order. Purchasing boxes and moving supplies can add up... quickly. If you know you'll be moving sometime in the next few months, begin saving Amazon or other shipping boxes instead of throwing them in the recycling bin. Post on Facebook or the NextDoor app asking friends and neighbors for spare boxes. They'll be happy to clear space and help you out. Check your local Walmart or other stores that get large shipments often. It's common for them to be getting rid of boxes and you can take them free of charge. 4. Break it into stages. Don’t wait until the movers show up to frantically throw your bathroom in boxes. Moving day is hectic chaos even for the most organized movers. Non-essentials can be packed away months in advance! Décor, personal pictures, infrequently used dishes, and countertop appliances can make a space feel cluttered when showing, so get these items boxed up early. Go room by room and make attainable goals for yourself like, “I will have the linen closet packed by 10:00 a.m.” If the idea of packing completely overwhelms you, consider hiring it out. 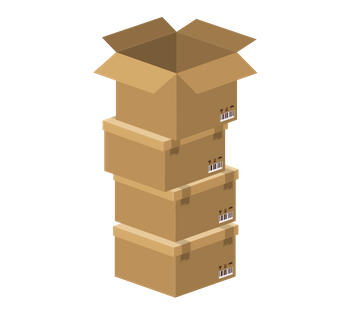 Most moving companies also offer packing services.